In marketing, it's very important that you offer the right product to the right prospect in the right way. Not “getting it right” can cause you a lot of pain and frustration; it can cause your company to lose a lot of solid sales opportunities and just might put it out of business and you out of a job. So it's very important that you not market haphazardly. You need to deeply understand and be intimately familiar with your market. You need to communicate with them in ways, and through channels, that resonate with them and that they respond to. So how do you do this? 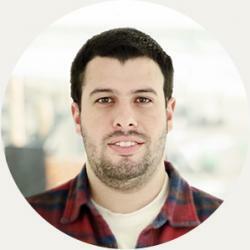 By developing and following marketing personas. According to Bryan and Jeffrey Eisenberg, personas are “modes of preferred behavior within the context of buying”. Personas help you develop that critically important quality for marketing success – empathy. They help you understand your potential customers in more detail. They help you understand their problems and frustrations. The more detailed and accurate you make your buyer personas, the more effective you can be at marketing to them. The more effective you can become at gaining more and more highly qualified leads. Translation – personas can be an integral part of making your career and your company very successful! If Marketing, Sales and Production will all work in a cooperative fashion, the disciplined use of personas can also help your company develop products and services that your customers will love. This could very well pave the way for repeat sales. Remember this: the different personas approach the buying process differently. You need to market to them specifically in ways that resonate with them. Trying to market to the competitive persona the same way you would market to the humanistic persona will kill your chances of successfully reaching and converting them. We've already discussed the competitive and spontaneous personas. Today, we will go into detail about the methodical persona and how you can win in your efforts to market to him. As you might have already guessed, the methodical persona goes about the process of buying very carefully and deliberately. Each of the four personas can be categorized on whether they tend to be emotional or logical and fast or slow in their buying habits. The methodical persona can be classified as both slow and logical in his buying decisions. In order to reach him, you need to keep this in mind and market accordingly. In other words, don't rush him through the buying process. He wants to take his time and consider his decision from a number of different angles. Give him plenty of marketing content to read, and don't be afraid to make it wordy and lengthy. Make your marketing copy and content very detailed. 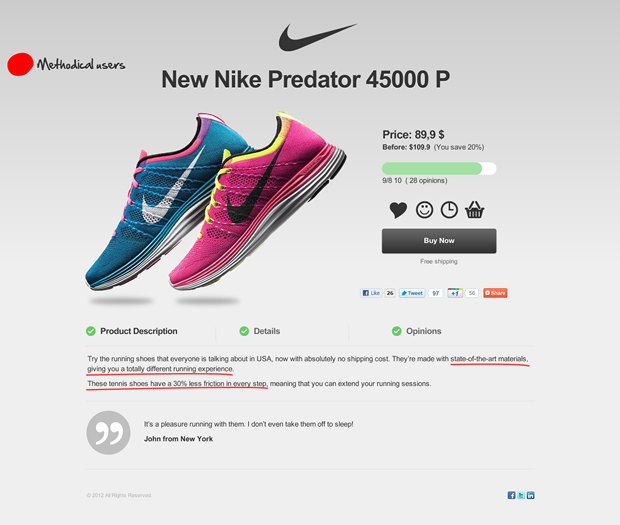 Include lots of specifications and facts about your product. Also, show him proof that your marketing claims are true. He's skeptical by nature. If your content only makes stupendous claims that you can't back up, he won't buy from you. Proof, Proof And More Proof! We can't emphasize this point enough. You need to show the methodical persona proof that your claims are true. Avoid marketing “fluff” like cute slogans; focus on facts instead. Include plenty of visual proof like charts and graphs in your content. And when you talk about benefits, focus on specifics. In your benefit statements, give him numerical examples of how your product will benefit him. Don't say “It will save you money”. Say “It will save you $2,543 per year”. Likewise, when you are showing him testimonials from your current very happy clients, offer testimonials with numbers and other specific, believable details. “It was awesome!” Bob C.
Do you notice the big, big difference between these two examples? Put yourself in the shoes of the methodical personality type for a moment. Which of these two testimonials would you be much more likely to respond to? The methodical persona is arguably the most difficult type to persuade and convert, and he doesn't want to be rushed. Like we mentioned earlier, give him plenty of detailed, fact-rich content to read. Let him take his time reading it and making his decision. Don't rush him. Don't place your calls to action too early in your content. Even though the methodical persona can be generally classified as “slow and logical” in his decision making habits, he's still human. He has emotions. And these emotions affect his buying decisions, although probably not as much as they would if he were of the spontaneous or humanistic persona. So what are the dominant emotional motivators felt by the methodical persona type? This list includes security, trust and control. He wants to be confident he is making the right decision, and is often fearful of making a wrong one. He wants to be convinced he's dealing with competent professionals with high quality products and services that will live up to claims made about them. He wants to feel like he's directing the buying process, not being pushed by marketers and salespeople anxious to rack up another commission. The methodical persona craves a lot of detailed content when he is making his buying decisions. He is an ideal candidate for a multi-stage content campaign that includes case studies, white papers, email marketing and webinars. And a most effective tool for marketers to use to help persuade prospects to sign up for content, as well as a great tool to capture leads, including the methodical persona, is the landing page. 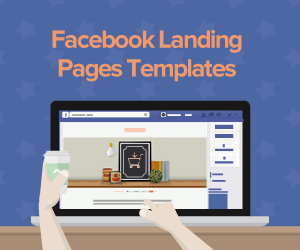 But remember to keep your landing pages consistent in tone and feel with the rest of your marketing pieces. The methodical persona likes order and presicion. He hates chaos and disorganization. Keep your landing page design simple and uncluttered. Don't include any graphics not directly related to your message. And don't include anything – graphics or content – that will hurt your conversion efforts. Offer plenty of facts and proof on your landing pages as you attempt to convert him at the critcal moment of truth. Include relevant, fact-filled, specific testimonials. Video testimonials are a powerful tool to use as marketing proof. But if you want to use video testimonials, you'll need a landing page platform that lets you include them. And since the methodical persona is perhaps the most challenging of the four personas to persuade, why not market to him with a landing page platform specifically optimized to help marketers like you enjoy higher conversion rates? 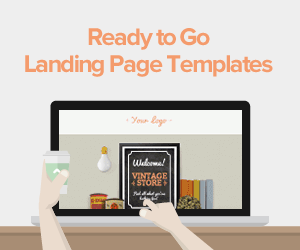 Looking for an easy-to-set-up landing page platform that gives you these things? 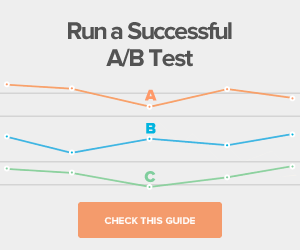 One that supports video and is engineered for higher conversion rates? Lander fits the bill. It lets you present the methodical personality type with a landing page (a critical link in your marketing chain) that is orderly, simple and uncluttered with “fluff”, exactly the kind of marketing environment he insists on, the kind of marketing environment that will help you convert him. Lander offers you a selection of fonts and distinct, easy-to-notice call to action buttons that enhance, instead of detracting from your efforts to market to the methodical persona. It's loaded with features that let you market to him the way he wants to be marketed to. And it's full of features you will love, features that will make your marketing efforts to any of the buyer personas more profitable. 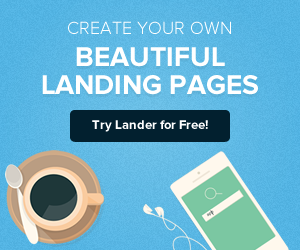 And here's something many of our users love: you can try Lander's easy-to-set-up, conversion-optimized landing page templates for free! Got questions? Want to find out more about Lander and how we can help your next online marketing campaign be a smashing success? Contact us today!